Home Bitcoin ETF Bitcoin Price Analysis: BTC/USD Long-Term Reversal Underway? 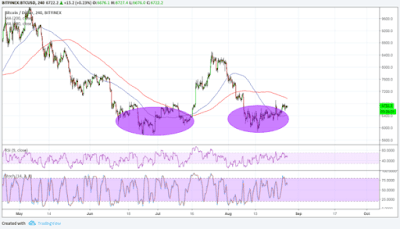 Bitcoin appears to be gaining a bit more traction on its latest bounce, possibly creating a long-term double bottom pattern. This is seen as a classic reversal signal from a downtrend, but the price would need to test and break past the neckline around $8,500 to confirm this. The 100 SMA is still below the longer-term 200 SMA on the 4-hour time frame to signal that the path of least resistance is to the downside. In other words, this means the selloff is more likely to resume than to reverse. Price has moved above the 100 SMA dynamic inflection point, though, so a bit of bullish momentum is picking up. The price might need to test the next inflection point at the 200 SMA from here, and it would need to sustain an upside break to confirm that a double bottom is in the works. A break past the neckline could lead to a rally that’s the same height as the chart pattern itself, which spans $5,800 to $8,500. RSI is turning lower, though so there may be a return in selling pressure from here. Stochastic is also pointing down and may move south so bitcoin could follow suit. Price did draw support from news that the SEC is reviewing its latest decision to reject several bitcoin ETF applications. This could keep traders hopeful that the regulator could be open to revisions or working with the companies involved in order to address the concerns on price manipulation and fraud mentioned. Also, this could keep hopes up that the next batch of bitcoin ETF applications awaiting their ruling towards the end of September could see a positive decision. In any case, the turnout of their review could provide an indication of how their next decision might go.